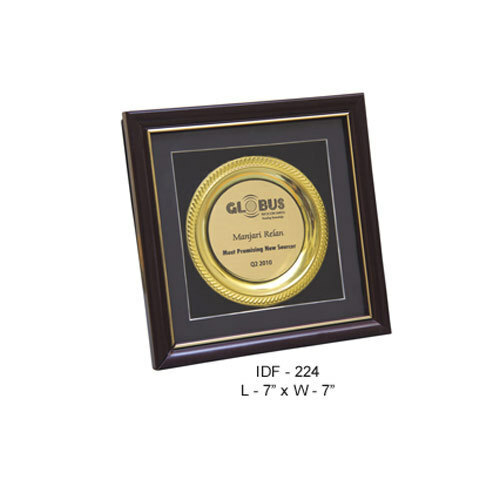 Providing you the best range of globus certificate, convergy award, wooden award, bharti axa (plaque), plaque and wooden name- plate with effective & timely delivery. With rich industry experience, we are manufacturing and supplying wooden awards that are designed for Globus Certificates Company. Manufactured using best quality wood, the offered range can also be customized as per the requirements of our clients. Further, the offered range is widely known for its artistic look and perfect finish. Our clients can avail these products from us at the most affordable rates. 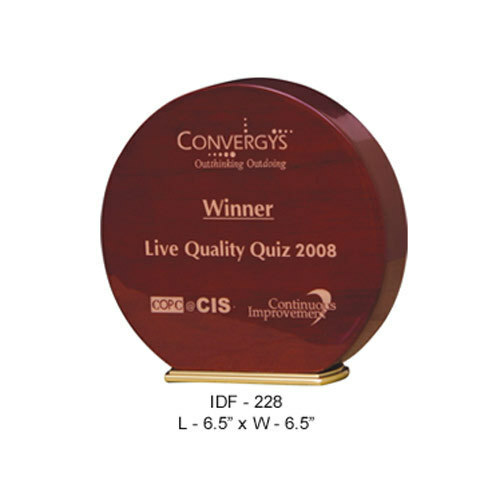 We are one of the leading manufacturers and suppliers of a vast range of Convergys Wooden Awards. Wooden Awards offered by us are made by our expert designers using premium quality of wood in the fabrication process. These Wooden Awards are widely appreciated for its unique and artistic design and very tempting look. Our products are available at market leading rate. In addition, these are offered in market at competitive rate. Uniquely designed, our range of Wooden Windows Awards for Windows is available in various designs and sizes. 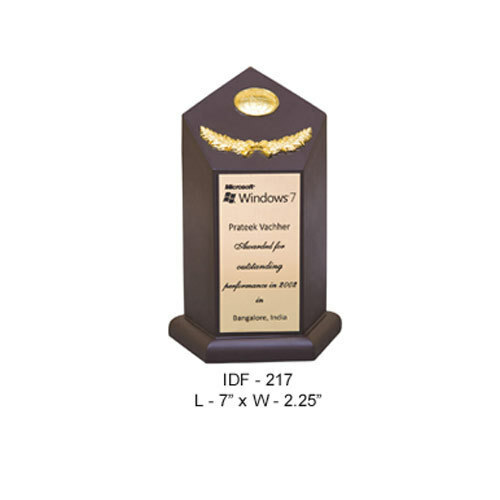 Our clients can avail from us customized range of these mementos as per their specifications. These are ideal for presenting on special events and are used in numerous commercial and corporate sectors. Further, our range is fabricated by our expert craftsmen using superior quality of wood. Highly appreciated by our clients for attractive appearance and perfect polish, these are available at market leading rates. 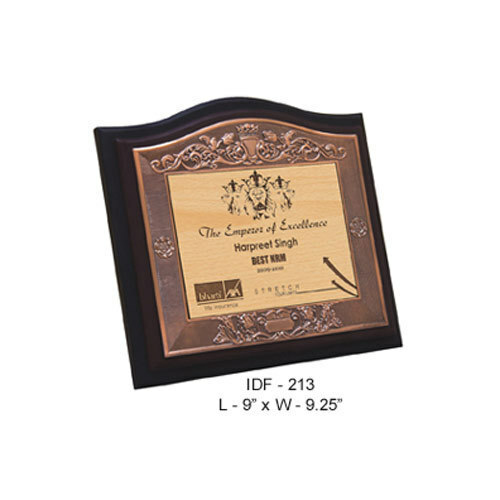 We provide an unmatched range of Wooden Plaque that is made using quality raw material procured from certified vendors of the market. 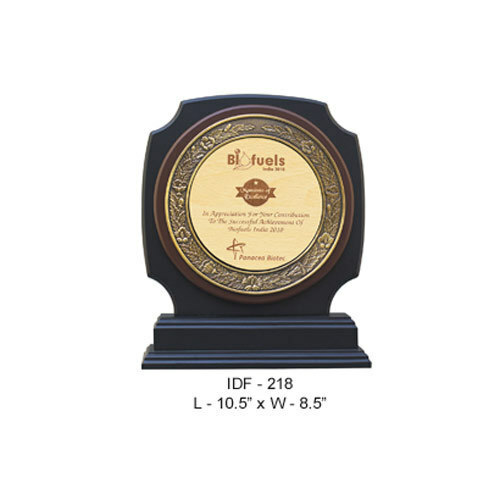 Due to their unmatched design and finish, these plaques are widely in demand with numerous domestic as well as international companies. Our quality is trusted by many reputed organizations including the Bharti Axa (Plaque). We are one of the most eminent manufacturers and suppliers of Wooden Plaques for Bharti Axa. This range is highly appreciated for its attractive designs, finish and high durability. Superior quality wood is used by our expert craftsmen while manufacturing these and numerous quality tests are also conducted by our experts in order to ensure their compliance with defined quality standard. 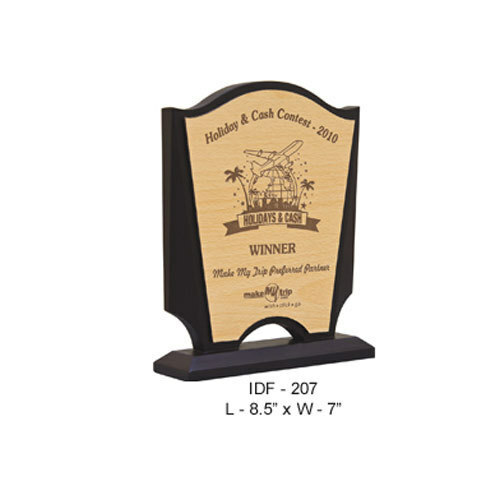 Our wooden plaques are used us souvenirs in award functions and corporate events. The Plaques wooden award offered by us is a result of superb craftsmanship of our wood engravers. Crafted using best quality wood, the offered range is known for its superior quality, eye-catching designs. Further, as per the requirement of our valued clients, we can customize the range in terms of size, design and patterns. Further, our range has gained a lot of appreciation from our valuable clients due to its attractive appearance, perfect polish and competitive rates. This elegant wooden name-plate is the perfect accessory for apartment doors. 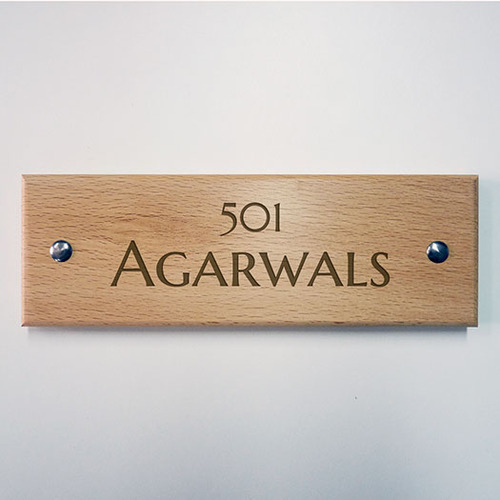 Each name-plate comes with a pair of mirror screws..
We are representing an enthralling collection of Wood Plaques, which is known designed for Panacea Biotec. This range is manufactured using high class raw material that is sourced from our certified and trusted vendors. These engraved wooden plaques are highly acknowledged by clients due to their perfect finishing and excellent designing. These products are stringently tested on the various quality parameters in order to deliver quality products to our valuable clients. Our Plaques are available at the most affordable prices in the market. 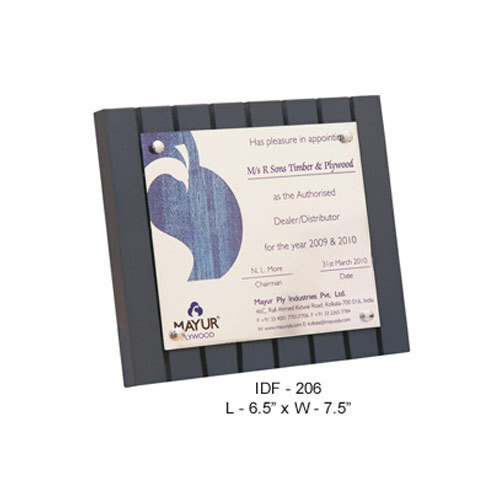 Keeping track with the latest trend of promotional trends, we are involved in manufacturing and supplying an eye-catching collection of Plaque of premium quality for Mayur Plywoods. Our clients can avail the range in various specifications to meet their exact requirements. Further, as per the requirement of the client, the range can also be offered in customized specifications. Our range is fabricated using premium quality of wood procured from our reliable vendors. Your photo, graphic and/or text is etched on to a wooden plaque to create a unique personalized gift. Comes in size 5"x7" @ RS.575/- inclusive of delivery charges. Blends in perfectely in all kind of Home decor and a perfect Gift for wedding and Birthday. Looking for “Wooden Awards and Certificates”?